Students, get the right book at the right price at the Guttman Online Bookstore & Marketplace. All courses, required materials, and pricing options are displayed in a personalized, easy-to-use page when you login with your school ID and password. For questions regarding an order, please call 1-800-887-6459 or visit guttmanbookstore.com/help. Where is the Guttman Bookstore? 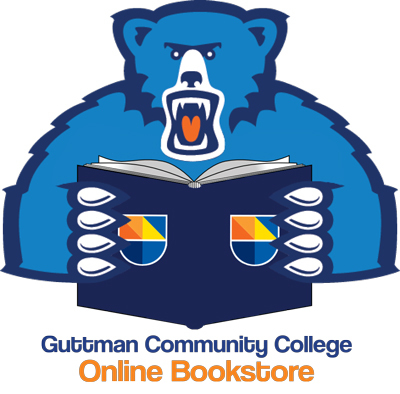 The new Guttman Bookstore operates completely online and can be visited at Guttmanbookstore.com. Students place their order online and then have it delivered to their homes on an individual basis. How do I order my books? 1. Visit the website at Guttmanbookstore.com and log in with your CUNY Login account. You’ll see a page with all of your registered courses and assigned course materials. 2. Select from the new, used, eBook, rental, and Marketplace options. 3. Follow the on-screen prompts to check out in less than 5 minutes! When should I order my books? The bookstore is always open, but the earlier you place your order, the more chances you have to find the best deals. It’s recommended that you order 1-2 weeks before the term begins. The Marketplace is where students and others across the nation buy and sell books from each other at discounted prices. It also includes listings from other top selling textbook websites so you have the option of buying the correct book from another vendor if the price is lower. Check out with any major credit card, Paypal account, or approved financial aid voucher code. If you don’t have a credit card, you can use Visa gift cards, or similar, to order. The Bookstore offers various shipping methods and time frames. Orders over $49 qualify for free economy shipping (does not include third-party Marketplace items). Use the Order ID number in your confirmation email to check the delivery status. Not all Marketplace vendors offer tracking, but you can contact the seller through the website. Most orders can be returned for a full refund as long as it’s within 30 days of the order. eBooks can be returned within 14 days. Marketplace items are non-returnable. Items ineligible for return are marked “nonreturnable” at checkout. Check the website for full details. If you miss the deadline to return or you ordered a book that is not returnable, you can always sell your book on the Marketplace. You can sell any book, not just textbooks, on the website. Visit the “sell” page on the website, post the book that you want to sell, name your price, and then wait for a bid to come in. Visit Guttmanbookstore.com/help or call 1-888-286-8249 to talk to a customer service representative.